Owner Rod Cooper. Photo credit Donna Price. Crazy R's. Photo credit Donna Price. Rod refinished this antique bar. Photo credit Donna Price. Directions! Photo credit Donna Price. Crazy R's is a finalist for the 8 Wonders of Kansas Cuisine because of the excellent food, fun decor, good service, and the personality of owner Rod Cooper. Restaurants become icons for all sorts of reasons -- good food, good service, interesting decor, and the characters that run it. Sometimes those characters are the waitresses but in this case, the character is definitely the long-haired owner Rod Cooper. Maybe a better description is to say he simply does things his own way. It's turned out that his way has resulted in a really good restaurant for Goodland. Crazy R's opened in 1987. The metal building feel vanishes as soon as you step inside where you'll find lots of visual stimulation. Rod loves history and collecting antiques and you'll see many of his finds hanging on the walls, or, like the old gas pumps, standing in the corner. Rod refinished the antique bar that is an eye-catcher in the front room. Rod does all the cooking himself and the recipes are in his head. One reason for Crazy R's success is that fresh meat is purchased from the next door meat locker. In fact, quality steaks are what have put Crazy R's on the map. Prime Rib night is Wednesday. 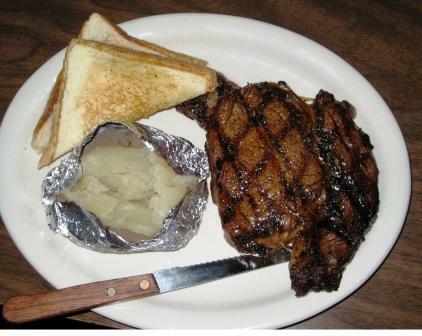 Steaks are just served 5-9 p.m. -- unless you can twist Rod's arm that is. 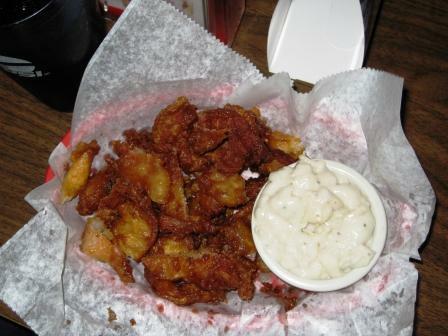 Papa's Chicken Fried Bacon (2-3" lengths of bacon, hand-battered, deep-fat fried and served with white gravy). Crazy R's is popular because it's comfortable and the food is great. Alcohol is served but to the community, it's a family place. Rod does little advertising but relies on satisfied customers spreading the word -- and they do. Local hotels recommend it, hunters come back year after year, visiting sports teams and I-70 travelers love it, and then there are just people that'll drive a long ways to get a Crazy R fix. Sometime Rod will leave the kitchen and come out and visit with customers -- and then you can decide for yourself if the place deserves its name. Steak from the next door meat locker!